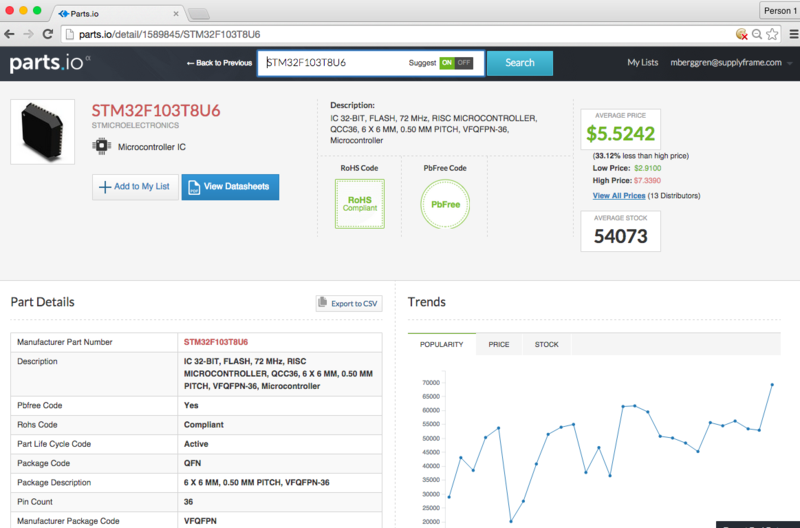 Now you may already know Supplyframe as the folks behind sites like findchips.com and others like hackaday.com, oemstrade.com, and as the makers of QuoteFX, but Parts.io is something truly new for the Supplyframe gang. 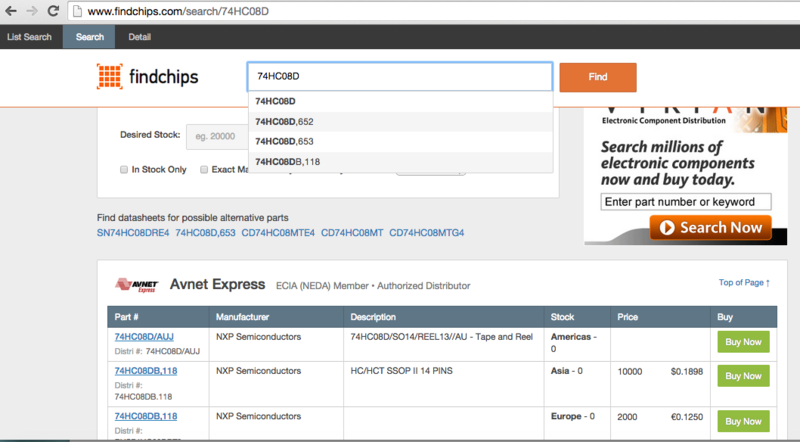 Firstly, where findchips.com aggregates pricing and availability detail from across multiple distributors once a part number is known, Parts.io uses that same pricing and availability engine – coupled with the ability to search for components parametrically – to help you arrive at that part number…and this is the piece that gets us excited! So imagine you have an idea, a keyword, what-not; engineers are constantly challenged to connect those conceptual elements back to the real part number(s). Likewise, there’s the challenge of knowing the part category (OpAmp, LDO, etc) and again, dialing that in parametrically to get to an actual, orderable component. This is where Parts.io attempts to bring these two critical processes together: discovery and supply chain detail under one roof. What’s more, the layout of the site brings best-in-class UI / UX design to what are some pretty well understood yet oft poorly implemented processes. 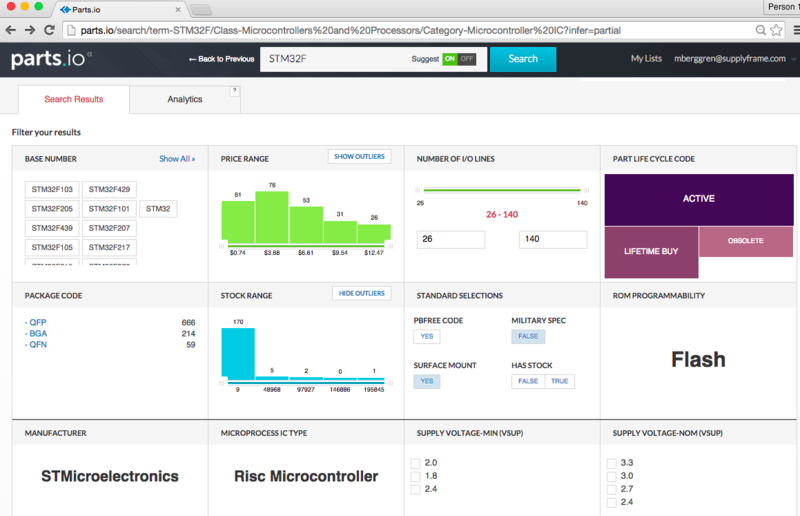 Gone are the days of the spreadsheet-style view of component parameters. Instead replaced with easy to navigate visual components that bring this into the modern era. Included also are graphs of things like pricing, popularity and a host of other dimensions to give you more to work from than what you may be used to. There is a PDF viewer built in, that pops out when you select a data sheet (don’t worry, they can also be downloaded!) 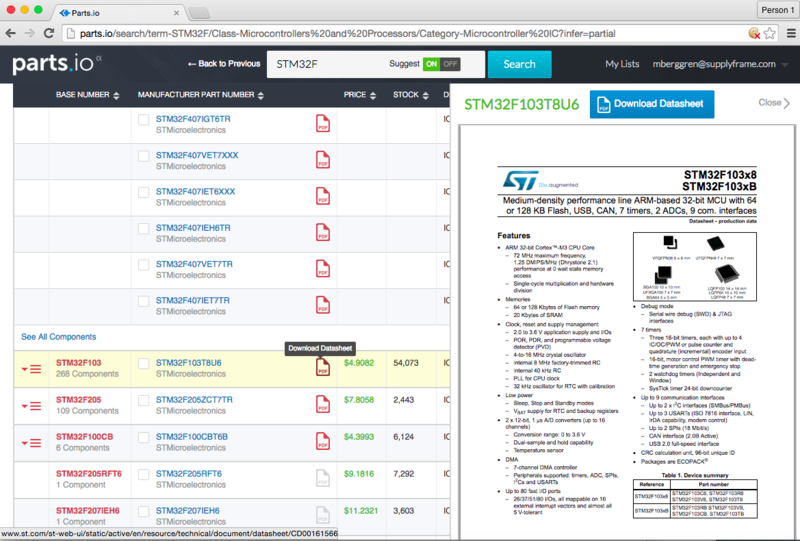 and we found this super useful as we toggled between 3 or 4 different flavors of the STM32Fxx series from a list to find the part we were after. And finally don’t be put off by the login on the landing page. Your details aren’t being sold, but you need this to be able to save lists and save favorites, etc. (the list feature also supports you uploading a CSV / Excel BOM and costing the list…nice touch!). All of this adds up to something pretty special! Congratulations to Chris and the Parts.io team, this looks awesome!